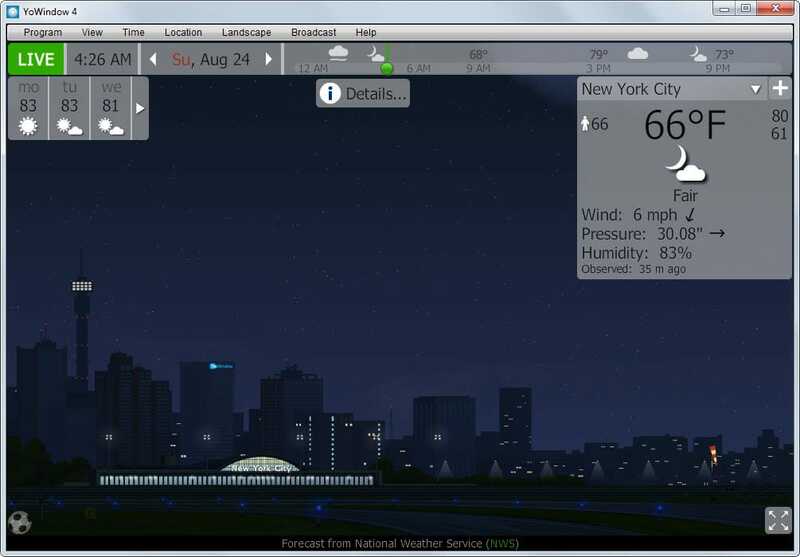 The best desktop weather programs for Windows | ComTek Computer Services Inc. The Internet has simplified how we access weather information. Before that, you had to rely on the newspaper, TV, or phone to get weather information. With the rise of the Internet came dedicated websites that provide you with the information you require in real-time at all time. Nowadays, apps are available that run on your smartphone or tablet at all times to provide you with weather information. If you are using a desktop PC, you may like to run a weather program on it as well to look up information whenever the need arises without having to load a website first to do so. 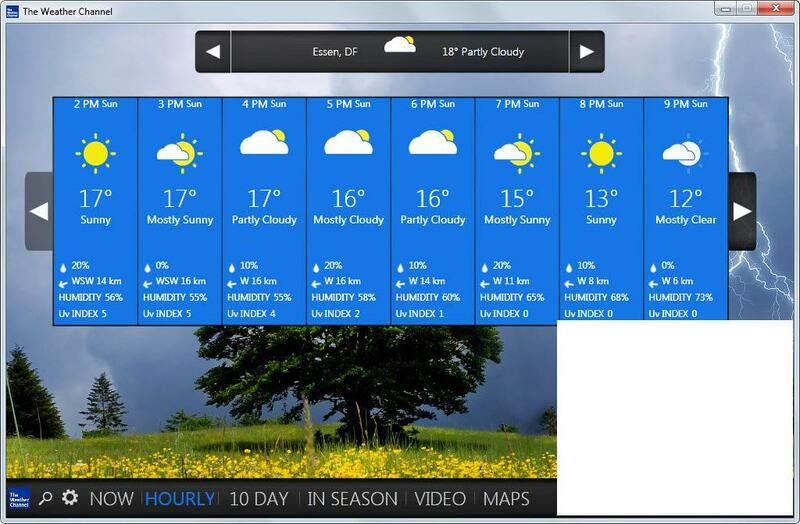 The following top list contains the best weather software programs for the Windows operating system. As always, all programs had to meet the following set of requirements to be included in this list. A free version needs to be available. It needs to be compatible with all recent 32-bit and 64-bit versions of Windows. The program needs to be a dedicated weather app and not part of a collection of tools, e.g. Rainmeter. The top list starts with a quick summary of each program that made it followed by a comparison table that you can use to compare features and recommendations in the end. The program provides you with information about natural hazards. It monitors locations that you add to it to inform you about earthquakes, tsunamis, fires, landslides or volcanic activities. Some of the information the program makes available cover the United States only while others are available for other countries and locations in the world. 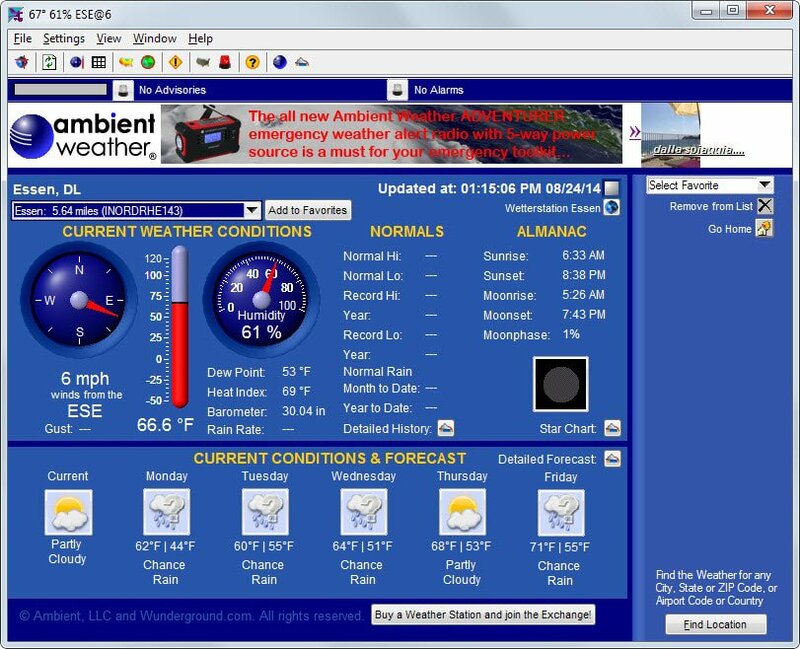 The portable program sWeather displays current day weather information in its interface. While you can add multiple locations to it, only one is displayed by the application at a time. There is however an option to load an expanded view which displays information about all configured locations in a table that includes a weather forecast as well. Information include highest, lowest and current temperature, humidity, visibility and barometer information, wind speed as well as sunrise and sundown time. 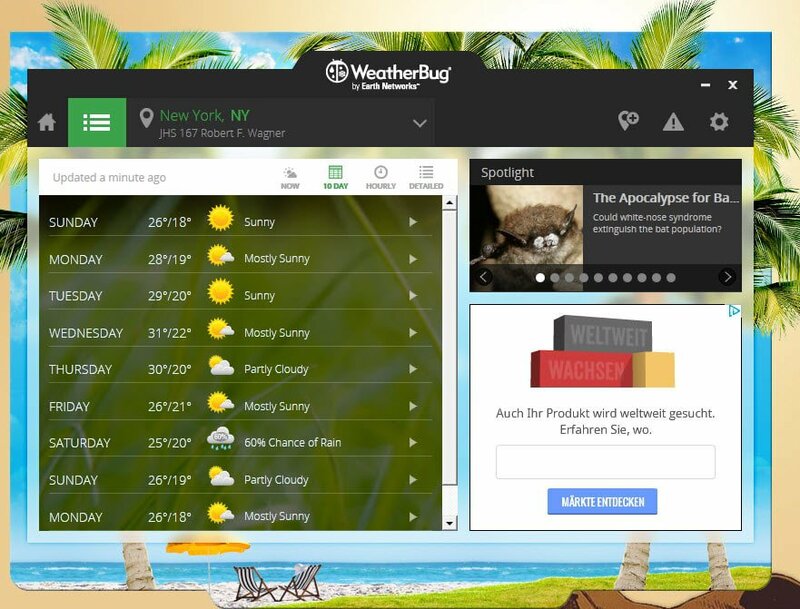 The official Weather Channel program for Windows requires the Microsoft .NET Framework 4.0, includes adware offers, and displays advertisement in the program interface. 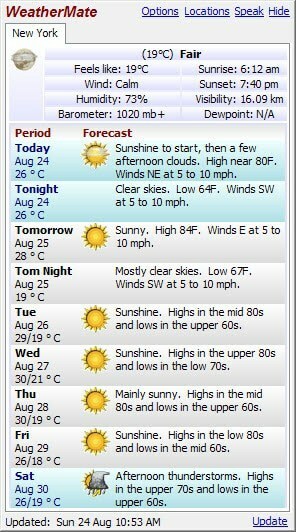 The weather information that it makes available are extensive. You can add one or multiple locations to it and check out current weather conditions as well as hourly and 10-day forecast information. Included in the software program is an option to stream weather-related videos and to check various maps as well. The free program displays a five-day weather forecast of a single location on startup. You can change the default location Prague but it is not possible to add multiple locations to the app. For each day, it displays high and low temperatures, wind speed, precipitation, sunrise and sunset, as well as moon phase. The free program is powered by a community of weather enthusiasts. Information that it makes available for locations are extensive as you can see from the screenshot above. Besides detailed information about temperatures or precipitation, it makes available advisories and alerts, and a five-day weather forecast. The program requires the .Net Framework 4.0, includes adware offers during installation, and uses a ton of memory when running. While all of that speaks against it, the functionality that it makes available may appeal to some users. You can add as many locations as you want to the program to keep track of weather information for each. The weather app displays the usual information such as humidity, felt temperature, sunrise or sunset, but also radar images, live cams and photos. 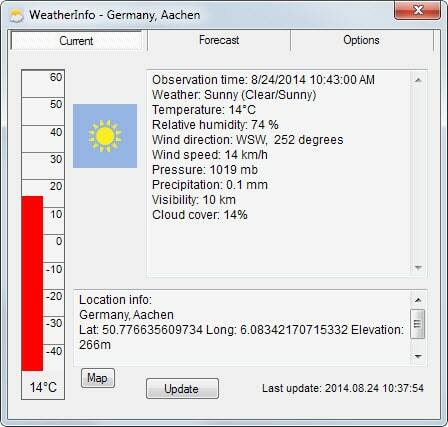 WeatherInfo is not a lightweight application despite its looks. It uses a good chunk of memory which can be attributed mostly to it requiring the Microsoft .Net Framework. The app itself displays weather information of a single selected location in its interface. It divides the information into a current tab which highlights current conditions and forecast, which displays information of the next five days. 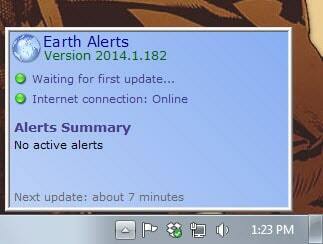 You can configure it to display the current temperature in the system tray. 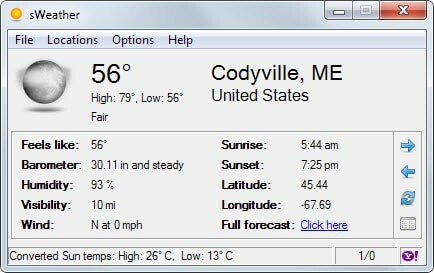 WeatherMate displays weather information for a location that you select in the program interface on startup. You can modify the information that it displays using the options menu. Here it is for instance possible to enable the detailed forecast or a weather radar image. Regardless of whether you pick imperial or metric, the forecast is displayed in imperial units only which is problematic for anyone living outside the United States. Information that it provides including the temperature, cloudiness, wind speed, humidity as well as sunset and sunrise for the current day. The desktop version of YoWindow requires Flash for Internet Explorer to work. It displays detailed weather information for a select location on start, with options to add, remove and edit locations easily in the interface. While it can only display information for a single location at a time, it is providing you with current weather information as well as forecasts for the next three days. The program ships with a couple of other features such as using it as a screensaver and displaying background images based on the location you have selected. If you want a lightweight program that provides you with excellent forecasts and all the information you can possibly want, then sWeather is the first of this list that you should take for a test ride. While it may be too bare bones for some, it makes up for that with low memory usage and being portable. If you prefer fancy, I suggest you give YoWindow a try. It supports several weather sources but restricts forecasts to three days in the free version.